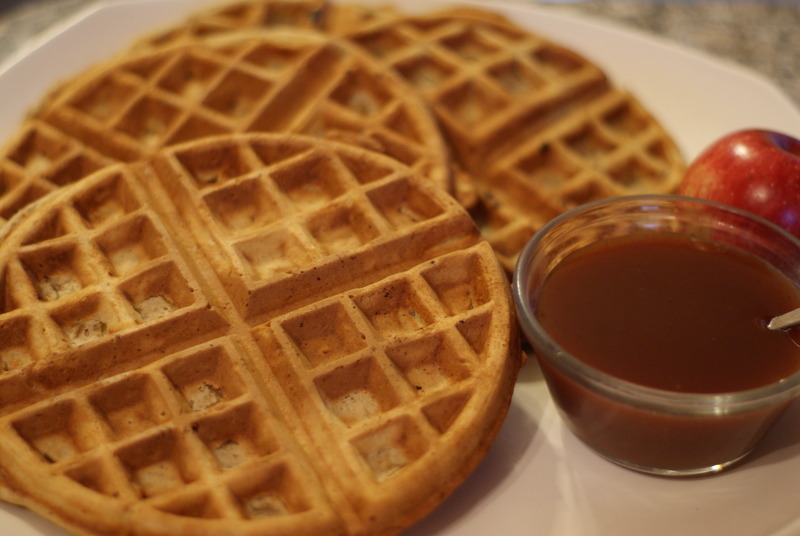 Today we decided to do breakfast for dinner and have Pumpkin Waffles with Apple Cider Syrup! We just assumed that this would be a family favorite and we were not wrong. It was a busy day today and I wanted to be able to savor this meal as a family and discuss the high/low points without rushing out of the house. Usually Sunday mornings are pretty low key around our house. Today was the exception as I chose to do some volunteer work for Cleveland Metroparks levy campaign at a local church. As a side note and since I am in the swing of it…Cuyahoga County residents, please VOTE FOR ISSUE 80 this November 2013! Now back to waffles. Once I returned from my day of work at the nature center, I found Chris and Penny had already made the Apple Cider Syrup and were just getting ready to start making up the waffles. The sweet smells of fall lingered through the house as I entered the kitchen door. Apples, pumpkin, cinnamon and waffles. YUMMY. They were absolutely delicious and we will definitely add these to our favorite breakfast recipes. One reviewer complained that they waffles were not very sweet. I don’t know about you but I find that since waffles are a delivery system for syrup they are not usually sweet. They were perfect and you will not be disappointed at any time of the year. Combine the flour, baking powder, cinnamon, allspice, ginger, salt, and brown sugar in a mixing bowl. In a separate bowl, stir together the pumpkin, milk, and egg yolks. Whip the egg whites in a clean dry bowl until soft peaks form (NOTE: Chris didn’t really do this).